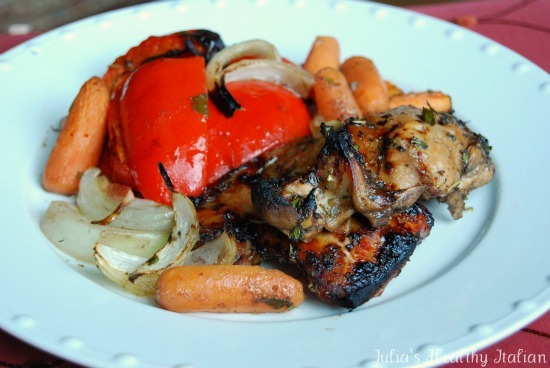 Balsamic chicken is moist and super flavorful. Served with vegetables or over a bed of quinoa, it's a Perfect Every Time Meal. Whenever I want succulent deliciously marinated chicken, I simply take a bag from the freezer, thaw it, put it in a tray and bake it. I never even have to wash my hands! I often make a bed of veggies to cook them on. This way I have a complete meal with no mess at all. When I get home from Costco with my 10 pounds of chicken, I get to work on my freezer bag meals. First I prep my freezer bag marinades while my hands are still clean (balsamic marinade below, Dijon marinade coming soon). I will do 2 bags of Dijon chicken and 2 more of balsamic. I portion out my chicken in 2 to 2.5 pound portions. I wash and pat dry the chicken. Next I put the chicken into the bags. Finally I massage the chicken and toss it into the freezer. Place everything in a gallon freezer bag, remove all the air and seal. Massage the chicken in the bag till it's well coated. Freeze it for another day, leave it in the fridge for up to 5 days, or cook it right away. I then chopped up 5 red peppers, 1 large onion and 2 handfuls of baby carrots and tossed them all around with the chicken to coat them a bit with the sauce/marinade. 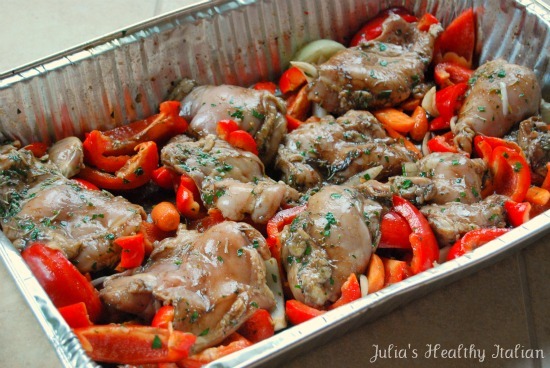 Arrange the veggies on the bottom of the tray and the chicken on top, pretty side up. I baked it all at 450 degrees for 40 minutes. If you want, and it's not essential, once you remove the chicken from the oven, you can pour the juices in a small pot and reduce the liquid by half and pour it back over the chicken. It will concentrate the flavors and make it even tastier. Chicken looses 25 percent of its volume when cooked, so 2.5 pounds becomes less than 2 pounds which is perfect for a family of 4 with leftovers or a family of 6 without leftovers. Don't freeze the vegetables in the bag. They will not be nice when you thaw them. 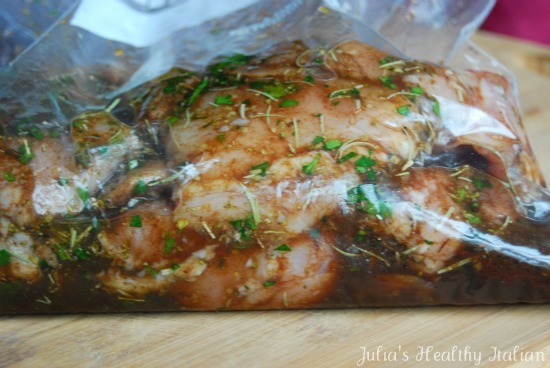 If you want smaller freezer bag portions, just put less chicken with the same amount of marinade. You'll just have more delish juices for your quinoa to soak up. OMG,what a genius idea! It sounds delicious, I will totally have to try that soon!!! Do I have to defrost the chicken first or up the cook time when it's frozen? Love this dish Julia!! And I love how organized you are prepping everything the same day. Hi jule, I typically pull out a bag of marinated chicken before I leave for work in the morning and just leave it in the sink. By the time I get home, it's just about defrosted. You could defrost it in the microwave I suppose, but I haven't tried. I typically know what I'm making for dinner the night before or that morning. I have to! We rarely eat out and if I don't cook, no one else will :( With a little planning, I have a week of breakfasts, lunches and dinners for all 7 of us. Look out for the tab called freezer bag meals. I'm going to post more of these type of meals there. Sorry, I had a typo! I made this over the weekend for my family and they loved it! Thanks for the tip. Love the idea of freezing the chicken in the marinade - I've never done that for some reason. I made this for dinner last night and it was delicious. I made the Dijon ones last week. These will be a staple in my house. Also, I will be making a bunch of bags for my parents. My mom has to have open heart surgery, and these will be an easy dinner for my dad to make during her recovery. I also made your perfect brussell sprouts, and they were PERFECT. Unfortunately, I couldn't convince the three kids to eat them, but I kind of expected that. My hubby and I gobbled them up. Dani, that's a great idea. Sorry about ur mom. Hope she recovers quickly. Oh well, Brussels sprouts can be scary for kids !! More for you guys ! awesome crowd pleaser!!!! big hit tonight!!! This is on the menu for tonight....will extra virgin olive oil work at that temperature or regular olive oil? Red peppers, zucchini, carrots, and mushrooms are in the mix for dinner. Thanks!